I'm doing a series on my San Miguel Collection prints and am collaborating with interior stylist Mylene Raspado. The textile industry is a very important part of Mexico’s economy. The foot petal loom was introduced to Mexico after the Spanish conquest, and was most widely used in the central and northern parts of Mexico, allowing for bigger pieces to be made. I remember my parents owning a restaurant when I was younger called “El Zarape”. I went there a few times when they first opened. They chose to have sombreros and sarapes hanging on the walls as decoration. When the restaurant closed, all the decor came home with us. I would love trying on all the sombreros and looking through the colorful blankets; picking out my favorites. When I went to college, I took a sarape with me as a blanket. My roommates would make comments about how bright and colorful it was, but it was a piece of my culture that I could have with me among the very rural Michigan community. The Mexican culture as a whole is very bright, colorful, and happy. I love the colors in sarapes, but I’m also drawn to neutral decor. I like a nice statement piece to tie a room together, or add that splash of color. This vibrant picture can do that while still keeping the feel of the room neutral. 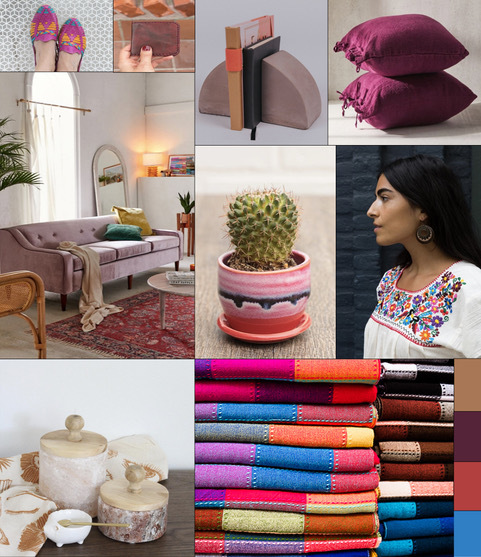 I love the warmth of the pinks, greens, and browns of this life style board. It reminds me of a girl who’s grown into a young adult and has kept her feminine style but added sophistication. What do you think? I’d love to hear in the comments. This week only (until next Wednesday), I'm offering free framing on all orders of the "Sarapes 2" print. Let me know if you have any questions about this design mood board, or this specific print. Just send me an e-mail, or leave a comment below.